Journalism and many other digital content services face an existential threat to sustainability, and are rightly looking to membership models as a possible solution. Consumers are questioning their value propositions, and advertising and sponsorship models are highly problematic for quality journalism as well as many other kinds of creative content. This post looks at the membership puzzle and suggests that the missing piece is a new economic logic for membership that personalizes individual member value propositions. I write in terms of journalism -- as a special, and especially urgent use-case -- but similar logic applies to many other forms of creative content as well. As you read "journalism," think also of music, literature, video, art, or any form of content as a service. Similar models are also referred to as patronship models, and often make use of crowdfunding platforms (like Patreon and IndieGogo) that support ongoing creative efforts. The economic logic of membership sustains ongoing value creation efficiently if and only if each member feels that the price he or she is asked to pay for membership tracks well to the value he or she gets from membership. No matter how great and how engaging the value of membership, if the price to each member is not reasonably well aligned with that individually perceived value (as a fair share of wallet), the solution is ineffective. The survival of journalism is too important to be left to the journalists! ...unless they refocus on the business and individual value propositions of journalism. Journalism is a service -- to individuals and to society. The current existential crisis in journalism is primarily a crisis in the economics of that service. The solution is not just better journalism (important, especially in the age of "fake news") but better economics (essential). Finding the answer to this crisis is complex, with numerous pieces to be fit together. Many are considering this puzzle and seeking new paradigms, including "membership" -- a more relationship-oriented view of recurring subscription services that focuses on supporting them primarily by member payments (often voluntary payments) -- which requires making these services smarter, more cooperative, and more customer-first. These efforts have identified many important pieces of the puzzle, but there is a unifying piece missing. I center on the economics of individual member relationships as the unifying piece that aligns the other pieces into their proper place, and outline some strategies for shaping that central piece. Value exchange is core to the missing piece. That it is not simply a matter of making journalism more valuable. 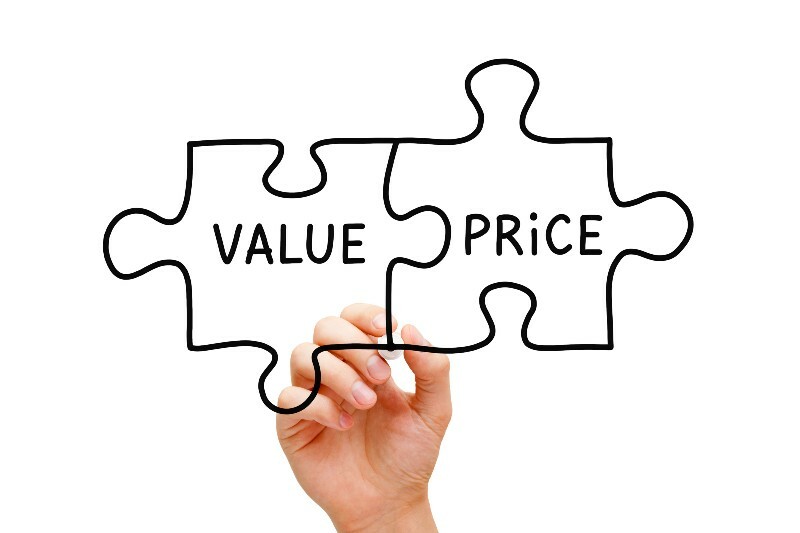 When a value exchange relationship involves a price, value is sustainably exchanged only if the price is right for the individual customer. That requires that value be quantified into a price, and that price be tailored to that customer. The missing piece is to build a process of co-creation that looks beyond the co-creation of "valuable" journalism as a thing in itself, to the nature of the co-creation of that value in economic terms, and to use that to continuously optimize the pieces to be offered to each member. The currency for this economic value of journalism is money. Creators of journalism need fees from their members to survive and continue to co-create journalism with them. Each member is different. The fundamental economic question is what should the fees be for each member, as that varies over time. It is widely recognized that trust and transparency are key elements of membership services, and I suggest that financial trust and transparency are critical to that. For each member, we need to find a balance of value received and value given -- and to do that by adjusting the amount of any monetary payments made. Without a clear understanding of the value each member perceives from the features and activities of their membership, managers of member organization are flying with blurred vision and disconnected controls. Value varies from member to member and from time to time. Individual member value perceptions are determining factors in how all of the pieces should fit together for each member. This question of individual value underlies all the decisions of what journalistic value to create, who to deliver it to, and how to manage that. The old walls between the business of journalism and the craft of journalism were relevant to advertising-based journalism that needed so-called walls between "church and state" to protect journalism from pressure from advertisers. Those divisions are now impediments to a reader-supported journalism business that needs to understand the dynamic and individual value exchange with the readers (members) who it asks to sustain this deeper co-creation. While much is changing as journalism seeks to reinvent itself for the digital era, this division is deeply entrenched -- both in large established publishers, and in newer "membership"-oriented publishers. Large news publishers are beginning to take a more business-like view of value, but often not in a very customer-first or relationship-oriented way. Directions such as those outlined by David Skok's astute NiemanLab prognostication -- and being pursued by many large publishers -- view journalism as a product to be priced using a dynamic meter, at a transactional level (often per article), drawing on the lessons of analytics-based dynamic consumer-goods pricing. While effective in many contexts, this zero-sum game is antithetical to trust and transparency, and a dead end for journalism. It may help bring in revenue from a diversity of very occasional readers, but does not build real relationships with the regular readers who are the main reservoir of sustaining support. The membership model moves toward a more member-first, relationship-centered, co-creative view of the value proposition, but does not yet give that a necessary grounding in the core issue of member-specific value exchange. Much attention is being given to what pieces to offer and how to fit them together, to make them most valuable -- but this key piece seems to be largely missing: value propositions have two sides: what value, for what price. High value at a price that is not perceived to be commensurate to that value (for a particular member), is not really high value. Member programs are still mostly based on a one-size-fits-all price (even if that price is voluntary). Sometimes membership plans are tiered with different prices for different packages of services, but still that is generally a given package for a given price. Data on how individual members perceive those prices is very limited, and there seems to be little attention to developing that data on an ongoing basis so it can be used to continually and systematically refine what product mix is offered, to which members, when. Membership models are based on the understanding that readers (at least a significant portion of them) should pay for the journalism they want. We can do a great job of identifying who to engage about what, and what to offer them -- but if it all devolves to a single pre-set price of membership (even if it is voluntary), we have failed to find the right value proposition. and, whether or not payment levels are voluntary, intelligently nudging each member to be appropriately supportive. No matter how well you solve the membership puzzle, sustainable success will be all about the value that members feel they are getting -- and whether they feel they are paying a fair and affordable price for that. Some will be generous patrons of journalism, not just for themselves but for the community -- while some will be less generous, depending on their desires and means. With digital content that can be replicated at negligible cost, even those who are just marginally supportive can add sustaining profits. If the price for the value proposition seems too expensive (too much share of wallet), a prospective member will not join or pay (or if they do join or pay, will not be retained) and their contribution will be lost. If the price for the value proposition is too low for a given member (less than their fair share of wallet), sustainability will be starved. What I propose is a new perspective on the economic aspects of the membership relationship. The core of that perspective is that (1) the basis of the journalistic relationship must be economic, and (2) that economic part sustains ongoing value creation if and only if each member feels that the price he or she is asked to pay for membership tracks well to the value he or she perceives from it. No matter how great and how engaging the value of membership, if the price to each member is not reasonably well aligned with that individually perceived value (as a fair share of wallet), the solution is ineffective. I describe methods for continuously seeking to maximize that alignment in this blog, and in my book. More on that below, but first, some background on membership models. The Membership Puzzle Project (MPP) is a new and important effort to solve the problem of finding a sustainable path for journalism. It seeks to learn from a growing body of success stories in which publishers seek deeper relationships with their readers by becoming "customer first" and seeking new, more cooperative, and more individualized ways to co-create value. I have exchanged emails with the MPP team (an extract is below), and hope to meet with them soon. I have volunteered to contribute to that effort because my work on advanced, adaptively win-win forms of subscription/membership models is very relevant to the project objectives. 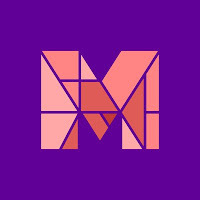 The MPP is a laboratory project led by Jay Rosen's team at NYU (along with De Correspondent, an innovative Dutch publication looking to create a US edition) -- supported by $515,000 in funding from three prominent foundations. While this project is specific to journalism, I expect it to provide lessons relevant to digital content services of all kinds. In a more recent report, "Members made a moral decision: this is something I should support." Notice this "social contract between journalists and members." Much of what I see discussed about this social contract involves aspects of the substance and process of collaborative journalism (as outlined in this MPP post) that I am no expert in. But Jay Rosen's NiemanLab article makes it clear that a core aspect of that social contract is the "'pay' model" and whether it works "to maximize trust in a 'readers pay the freight' model." This blog, and my book, are focused on emerging strategies for doing just that. Membership projects rightly make much of the importance of trust and transparency as central to the relationship of journalists to readers/members. A recent update by Jay Rosen, on their interviews of De Correspondent members, reports that "Trust through transparency is almost universally seen as a key principle...It shows respect for the reader, and it invites their participation, not just their attention." That is vital, but trust in the journalistic reporting/creation process is not enough -- trust depends on value. Misaligned value weakens trust. Conversely, trust enables the transparency, responsibility, and fairness needed to agree on value. Seemingly arbitrary pre-set prices detract from perceived value and compromise trust. 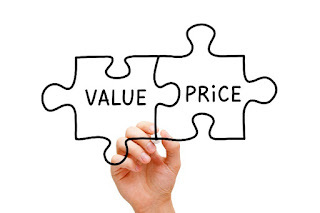 Even when such prices are voluntary, the process of setting prices and framing the value in the value proposition can add or detract from trust and transparency -- and from revenue. The MPP builds on numerous ongoing efforts to develop membership/patronship models, both relating to journalism and more broadly. NiemanLab features Shan Wang's reports on a variety of them, including the News Revenue Hub's efforts to help news organizations in such efforts. Even well-established major publications like the Guardian are trying membership models (a voluntary, but pre-set, $84/year). Other similar ideas are being applied to a wide variety of other kinds of content. Notably, some are supported by widely used platform services, such as those offered by Patreon and IndieGogo. Ben Thompson's Stratechery adds perspective, and expands on the importance of platforms to simplify and pool the mechanics of the back-end tasks needed. Much of the mechanics of FairPay that I describe here could be similarly offloaded to a platform (and some platform providers have shown interest), but whatever the back-end, the fundamental focus on member value remains core to journalists or other creators. 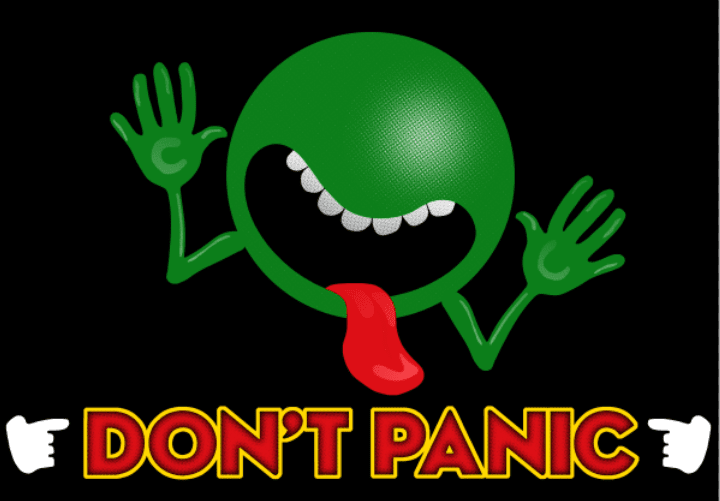 What should the price of membership be, and how insistent should a publisher be about that? The recent update on member interviews by Jay Rosen notes that while De Correspondent charges €60 for its voluntary membership, many members said they would pay much more, €100 to €150, even though they acknowledged that asking for that much up front might have kept them from signing up. Wiktribune takes a more discretionary approach, allowing members to pay what they want. But in any case, the question is how to entice members to pay their fair share -- and to make them feel good and trusting about it, so they continue to do so. Some of these efforts recognize the diversity of member needs by providing for multiple tiers of membership (or similar forms of patronship), often with different rewards. That is smart in recognizing that different members seek different value propositions. But it gets very complex, and the problem of individual variation is that managing this diversity (both from member to member and from time to time) gets intractable (and just leaving it to member whim risks erratic results). I addressed some examples of that in a previous post, and an interesting NiemanLab review of public media membership efforts by Melody Kramer shows just how complex this can get, (and how far afield of the core value propositions of a service -- tote bags, T-shirts, and coffee mugs -- it can devolve). Pre-set tiers are just not very workable. We need a more dynamically personalized and continuously adaptable approach. Think of the membership puzzle as analogous to a jigsaw puzzle that is different for each member -- and so must be solved anew for each member. A puzzle that does not picture value (as seen by the member in question) is like a jigsaw puzzle turned upside down, so that we cannot see the desired pattern of value we seek to solve for. Not being able to see the picture makes solving the puzzle extremely hard. Many membership program details are treated ad hoc and roughly benchmarked to competitors’ offerings (a line of thinking that goes if the other station in town costs X per month for members and if subscribing to Spotify costs Y, then we can charge…). Most media companies don’t carefully plan the details of their social contract, including pricing and participation asks. And this is not just a static problem. Keep in mind that that the puzzle for a given member this month may be very different from the puzzle for the same member last month. The reporting and features change, and the member's needs, attention, and desires change. To really solve this puzzle, we must evaluate the value proposition more or less continuously. Periodic member surveys (such as those being done as part of the MPP as a project effort) are an excellent start, and are current best practice. But I suggest that is just a start. This is something that FairPay seeks to make routine, and to operationalize it into an ongoing feedback control process that is integrated with the payment request process and the creation process (in an adaptively lightweight way), in the form of ongoing dialogs about value. This ongoing operational feedback from members integrates not only with financial operations data, but also with the core operational data and analytics about member usage. This combination of data and analytics enables ongoing optimization of what services are offered (journalistic and more broadly), to what members, when. We seek true partners in sustaining the co-creation of journalism for you and our other readers. We will seek to involve you in what we co-create with and for you, to provide you the services you most value. We will permit you to participate in setting prices that correspond to that value -- considering what you get from us, what you contribute to us, and your ability to pay (and how those factors may change over time) -- in order to support our continuing work. We expect you to be fair about that, at whatever level makes sense for you and is fair to us. Digital news stories (and subscriptions to them) cost almost nothing to distribute, so are not scarce and cannot be priced by the invisible hand. What is scarce is the fair share of a reader's wallet that is needed to continue to co-create more news stories. Any social contract that does not address payments is un-moored from the economic reality of sustaining journalism. Because individual members vary widely (and over time), a social contract that expects all members to pay the same price (and a constant price) is bound to be unfair to either the member or the publisher in most cases. with the input of the customer, who has unique knowledge of the value as experienced. While FairPay may seem complex, it can readily be simplified and reduced to habit, to the point that it becomes largely automatic except when adjustments are needed, as outlined in Profiting from Habit -- Seamless Monetization. 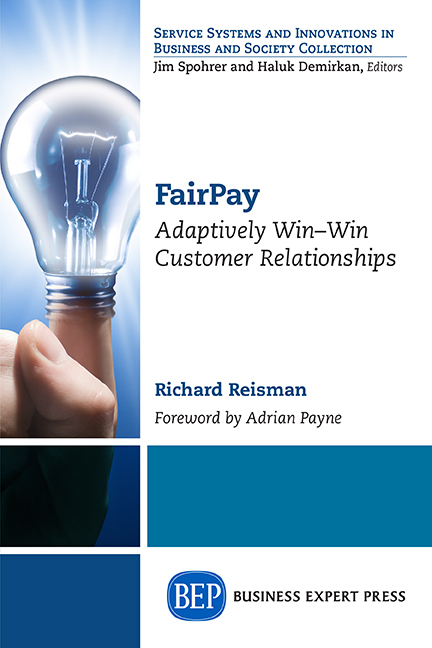 It may also seem that consumers may be inclined to be uncooperative and seek to game the system, but FairPay can be initiated for just those segments who will be most amenable, and even eager to cooperate (which is where membership models work best anyway), and then expanded from there, as outlined in Finding Good and Fair Customers -- Where Are the Sweet Spots? Post-pricing: Delaying final price-setting until after the experience, to enable the price to reflect the actual nature of the experience (what stories are read and engaged with, at what level and intensity, with what results). Participatory pricing: Involving the reader in assessing the perceived and personal aspects of the value exchange (value perceptions, outcomes, interests, objectives, priorities, tastes, as well as willingness and ability to pay). Bi-directional value propositions: The flow of value is not uni-directional (value to the reader and cash to the publisher). Often value flows in reverse (as Jeff Jarvis suggested), from the reader to the publisher, in the form of participation in journalistic creation, user-generated content, attention to ads (if any), use of personal data, and the many other forms of reader value contribution that are now increasingly recognized as part of the membership puzzle. To the extent that a pricing process factors in all these aspects, it enables what I call value differentiation. Related to the traditional economic ideal of price discrimination, value discrimination seeks to find the right value proposition for each customer. Price discrimination theoretically leads to an economically optimal price that maximizes revenue -- but it does that in ways that are are narrowly zero-sum and often secret and manipulative, and not reflective of the broader co-creative interests of both the publisher and the reader (detracting from trust and transparency). 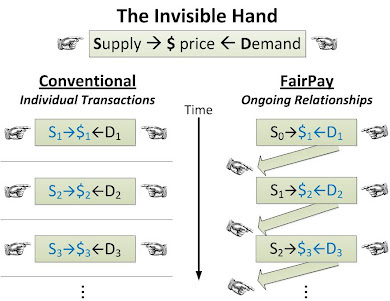 FairPay shows how the broader objective of value discrimination leads toward prices that seek cooperatively to optimize the value exchange in a much larger sense -- enabling us to factor in individual human and social values (to the extent mutually agreeable). This brings into the equation the social value of journalism and the need to sustain it, as well as the broader and more personal values of the reader, and solves it in a win-win, cooperative way that builds trust and transparency. The key point to remember is that we are not paying for current stories -- we are paying for a relationship that will continue to bring us stories -- doing investigative journalism, and providing other ongoing services in the future. That is the social contract, and its pricing must reflect that. FairPay is a flexible architecture that a publisher can apply with any of a wide range of policies. Negotiated levels of fairness can be achieved under policies that give the publisher more or less control, using as strong or light a hand as desired. In any case, the strategy is for the publisher to seek to nudge members toward fair (or even generous) levels of sustaining support. At one extreme member payments can be entirely voluntary (pay what you want -- or, more accurately, pay what you think fair) -- and at the other extreme strict fairness minimums can be enforced (mandated prices). The right choice will depend on the nature of the service and of its membership (and on the sophistication of the system implementation, which can start simply and be enhanced over time). For journalism, a balanced soft touch is likely to be best, with significant member discretion, but reasonable levels of individualized nudging for each member to to price fairly (for them). The full FairPay process applies rich dialogs about value -- but we need not apply all of its methods (post-pricing, participatory pricing, and bi-directional pricing) to see improvements in value propositions. All pricing methods can be ranked along a "ladder of value," based on the degree to which they apply these three aspects of value differentiation to find the right value proposition. By working our way up the ladder, we can improve our social contract incrementally. Some thoughts on how conventional pricing strategies can be ranked on this ladder of value are in my post, Finding Value in The Subscription Economy (I plan a more nuanced update that addresses all three aspects). As is highlighted by membership models, many are coming to realize that journalism is not a product but a service, and that those services are not created by journalists alone (to be thrown over the transom at readers, for a price), but must be co-created with readers (at least in part). This parallels a broader awakening in modern marketing. Many marketers are simply applying better technology to old ways of thinking, to apply old logics more efficiently (such as dynamic pricing, as set unilaterally by sellers). Unfortunately, that is a zero-sum logic that that kills trust. The more seminal trend in modern marketing is a shift to a new logic. Many scholars and forward-thinking businesses have recognized that our traditional Goods-Dominant Logic (in which goods are produced by producers and then sold to consumers) is no longer relevant, and a that a Service-Dominant Logic (in which services are co-created, in a win-win process) is far more relevant and powerful. As noted above, membership models take a perspective that is very aligned with Service-Dominant Logic. I propose that value is central to this (Value-Dominant Logic). Journalists would do well to understand this new logic of services that are co-created -- to see how broadly it can re-shape their view of their profession -- and lead to sustainable success. I hope the MPP team -- and others dealing with these problems (in journalism, and in other fields) -- will take a good look at these economic, business model issues -- issues of personalized value. I stand ready to assist in that. FairPay is an open architecture, not a product, and I am working on this as a pro-bono project (in collaboration with eminent marketing scholars who can assist with trials). As noted above, even when the full FairPay strategy is not used, understanding the ladder of value can help chart the path toward solutions that get closer to the efficient value differentiation that is needed to make journalism (and other content creation enterprises) broadly sustainable in this new digital era. Patron-izing Journalism -- Beyond Paywalls, Meters, and Membership – a summary. 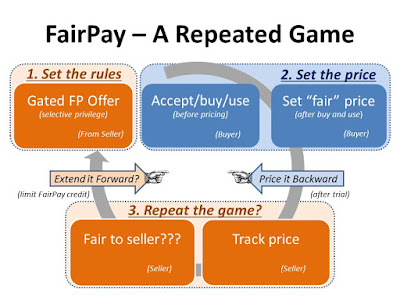 FairPay Changes the "Game" of Commerce – details of the core operational process. Finding Good and Fair Customers -- Where Are the Sweet Spots? – starting with low risk trials. What Lies Beyond Paywalls -- A Better Way – win-win relationships, not transactional sales. More detail and newer items. FairPay is unique in bringing new operational approaches to content businesses in a way that deeply aligns with emerging principles of marketing strategy, with strong foundations in behavioral economics. It is a new approach to setting value-based prices for digital content (“experience goods” that are really services, not products). This brings a deeply “member-first” approach to the operational basis of customer/member relationships. FairPay is fully aligned with, and can extend, the principles that have motivated De Correspondent -- and can point the way for others. It solves the “membership puzzle” with a personalized, adaptive architecture that coexists with set-price models and encourages free viral spreading. It enables memberships to be automatically customized to the interests and values of each member, founded on trust, value, fairness, and ability/willingness to pay. It is driven by ongoing “dialogs about value” with each customer that take De Correspondent’s ideas about dialog to the core of the value exchange. These include dynamically personalized value propositions (with reverse metering options to factor in the broad range of member contributions to value such as UCG, story leads, feedback, etc., and a rich concept of value that includes broad journalistic values). The dialogs about value directly link members’ financial support to value -- what journalists do, in what domains, and what else is offered -- in a way that drives sustainability of the publication and deepens engagement -- at a fine granularity that optionally can be a factor in individual journalist compensation and their relationships with their “fans.” It focuses on real value, not T-shirts.